Space to think, dream, and do. That's what the new wing of a major research facility dedicated in memory of Professor J. Mike White, founding director of the Institute for Integrated Catalysis, will provide for nearly 100 people. On April 28, 2008, 25,000 square feet of office space at the Environmental Molecular Sciences Laboratory, a national scientific user facility at Pacific Northwest National Laboratory, was dedicated to White's memory. In addition to his role with the IIC, White was a Robert A. Welch Chair of Materials Chemistry at the University of Texas at Austin and a distinguished EMSL user. White passed away unexpectedly on August 31, 2007, while visiting his son in Oklahoma City. During his lengthy career, he pioneered research in many areas of surface chemistry, catalysis, the dynamics of surface reactions, and photo-assisted surface reactions. White's wife Gwen; children Mark, Paul, and RaeAnne; daughter-in-law Melissa; and a standing-room-only crowd attended. A large bas-relief plaque memorializing White was unveiled during the dedication of the $4.8-million wing, which was completed in December. "Mike most embodied what he researched—catalysis," said Paul Bayer, EMSL Program Manager from the U.S. Department of Energy Office of Biological and Environmental Research. "Through his scientific expertise, mentorship, and collaborative nature, he was the catalyst for producing impactful science and mentoring the careers of current and future EMSL users." In White's honor, Bill Rogers, an Associate Laboratory Director at the Idaho National Laboratory, and Charlie Campbell, professor of chemistry at the University of Washington, have created the J.M. White Graduate Fellowship in Chemistry. Rogers and Campbell were both mentored by White early in their careers. 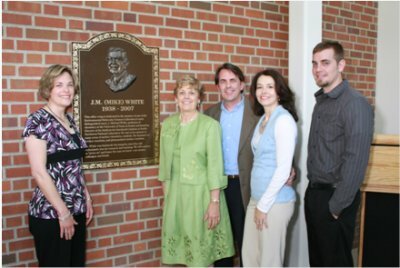 The family of Mike White stands next to the plaque erected in his honor at EMSL. From left: daughter RaeAnne, wife Gwen, son Mark, daughter-in-law Melissa, and son Paul.